The New York Times goes deep on The New Republic’s latest reinvention. I wrote a couple of pieces for the venerable magazine many years ago, and I wish it well. But I also wish Times reporter Christine Haughney had explored a conflict of interest in TNR’s relaunch: the participation of new owner Chris Hughes in a major interview with President Obama. I don’t necessarily begrudge Hughes’ wanting to play a role on the editorial side of TNR. It’s now his magazine, and previous owner Marty Peretz was a legendary interferer — sometimes for better, usually for worse. TNR is a small place, and it’s unrealistic to expect the publisher to exercise the same sort of restraint as, say, the publisher of a major daily newspaper. Can you tell us a little bit about how you’ve gone about intellectually preparing for your second term as president? Have you looked back in history, particularly at the second terms of other presidents, for inspiration? You spoke last summer about your election potentially breaking the fever of the Republicans. The hope being that, once you were reelected, they would seek to do more than just block your presidency. Do you feel that you’ve made headway on that? You inspired a lot of people in your first presidential campaign, and with your books, by talking about a new kind of politics. And now, four years later, it’s a time in Washington that’s characterized by nastiness more often that not. How do you reconcile those two things four years in? It seems as if you’re relying more on executive orders to get around these problems. You’ve done it for gun control, for immigration. Has your view on executive authority changed now that you’ve been president for four years? The last question is about Syria. I wonder if you can speak about how you personally, morally, wrestle with the ongoing violence there. A not-uninteresting group of questions. To be fair, I’ve included all of them so that you could see the meaty as well as the fawning. And Hughes and Foer elicit substantive answers from the president. Nevertheless, given Hughes’ background, I found myself asking if he might have been tougher if he were interviewing a president he hadn’t worked for. This is no more than a minor misstep. The real challenge facing TNR is that it is trying to carve out a niche in a world that has utterly changed since it was — at least in the movie “Shattered Glass” — “the in-flight magazine of Air Force One.” The Internet has made all but a tiny handful of political opinion magazines irrelevant. Getting TNR back into the game will be a daunting task. Hughes just made it slightly more daunting. I hope he comes to realize that himself. Who knows? Fawning may be the surest way to get back to mandatory in-flight reading on AF1. The death of journalism…or, when journalism is indistinguishable from propaganda. Fair point, but I doubt many TNR readers will not already be aware of Hughes’ Obama connection anyway. It’s not the same as a general newspaper audience. At least based on the NYT account, I’m encouraged by the kind of reporters he has hired. I’m interested enough to read it if they’d send it to me free the way the Weekly Standard does. I don’t think asking an open-ended, non-confrontational question is necessarily “fawning.” Even the question that mentions how Obama “inspired a lot of people” ends up asking him to reconcile that vision of a post-partisan America with the reality of hyper-partisan America today. Also, most news stories don’t let the reader see the journalist’s questions… I’m sure most journalists have asked a few softball questions, even while doing meaty pieces–to build rapport, to get their source’s verbal momentum going, etc. 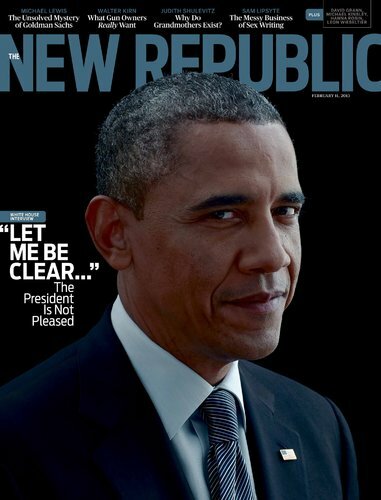 But–and this is a big “but”–TNR absolutely should have disclosed Hughes’s history with Obama. When in doubt, opt for transparency. Let the readers decide if his past connection tainted the story. I shouldn’t have had to find that out from your blog (great as it may be). Lastly: To my eyes, if there was bias in this TNR piece, it was the questions that didn’t get asked at all: the drone program, wiretapping, etc. Chris Hughes, who also got a ten-minute video tongue bath in today’s online NY Times, regarding his great plans for the venerable New Republic –which he’s owned outright since last March– was, of course, one of the original FaceBook developers which led in due course to him becoming a wealthy fellow indeed. He was also in charge, during the run-up to the 2008 elections, of all the Social Media projects at the Obama for President campaign’s national HQ in Chicago.